Bushwalking and Murphy’s Law go hand in hand. The eponymous Irishman, who was supposed to have stated: anything that can go wrong, will go wrong, is a constant companion for most who heft a pack and head bush. His law applies classically and typically to matters such as weather, and, of course, to the issue of false summits. And there are many other ways in which the law can influence your walk. But a good general summary would be this: a walk is always longer, further, higher and harder than you expect or remember. However … every now and then Murphy takes a vacation, and everything about a walk goes unimaginably well. On such a walk the weather forecast will be for rain or showers, but the precipitation will hold off. Instead you’ll only have cloud when you need it (on the steep uphill sections), and the sun will shine at all the right moments. On the first day you will be walking to a hut. Just as weariness begins to set in, and you start hoping that the hut is no more than an hour away, you’ll turn a corner and there it will be. There will be no-one in the hut, but the firewood will be dry and neatly stacked. The fire will be set in the wood heater, and a box of matches will be ready on the mantel-piece. After you’ve settled in only one other group will arrive to share the hut. That party will include a final-year massage student looking for people to practise on, and a generous European walker with an oversupply of good red wine that s/he insists on sharing with your group. After a wonderfully convivial night, you will awake refreshed – surprisingly so given that extra mug of red you probably shouldn’t have had. The day, according to the track notes, will have you climbing uphill for 4 hours to reach the summit of a dolerite mountain. There’s nothing for it – mountain tops by definition must be uphill. So you necessarily strain hard, but not too hard, to get to what looks like the top. Experience in Tasmania should have taught you that this is a false summit. But this time it will turn out to be the true summit. What cloud there is will part just as you reach the summit, with just a few wisps lingering on the neighbouring peak to give your photographs the requisite amount of atmosphere. As you lounge about the summit, the generous Belgian – or was s/he French? – joins your group, this time offering camembert and crackers. For one fleeting moment you wonder if champagne will follow. 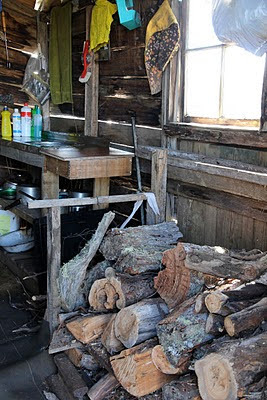 When you return to the hut, the massage student – who decided not to go for the summit – is so glad of some company, that she quickly offers to massage each member of the group. But first she insists on handing you a hot cuppa and some hut-made damper with raspberry jam. Of course such a bushwalk has never actually happened. 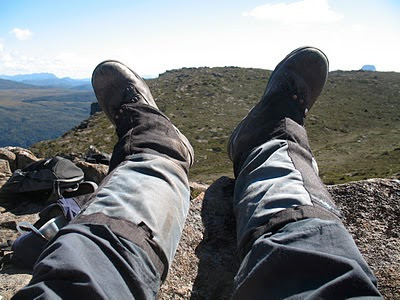 Life, and certainly bushwalking, wasn’t meant to be that easy. Yet strangely each of these little fantasy walk surprises – or something like them – has happened to me while bushwalking. Just occasionally Murphy will be busy elsewhere while you bushwalk. My advice, when it happens, is just to smile and take it! Footnote: a delightful variation on the law has been named “Muphry's law” (read it carefully!) It states if you write anything criticizing editing or proofreading, there will be a mistake of some kind in what you have written. Let those who comment on this blog bewhere!